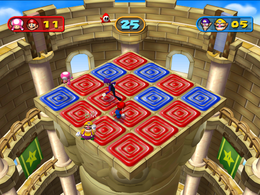 Tile and Error is a 2-vs-2 minigame in Mario Party 7. Its name is a pun on "trial and error". The two teams will be shown to a suspended platform with a grid of 16 tiles. Whenever a Ground Pound is done on one, the color changes. The basic object of this minigame is for a team to have the most tiles of their color when the time expires. In order to attack the competition, players don't only punch, kick, and jump, but also Ground Pound on top of each other's heads to flatten and temporarily stun them. Additionally, players who are knocked off the stage will be returned to the platform by a Fly Guy. Rules – "Ground Pound the panels to flip over your team's color." Advice – "Ground Pound the edge between 2 panels to change both of them at once." This page was last edited on November 7, 2018, at 19:14.